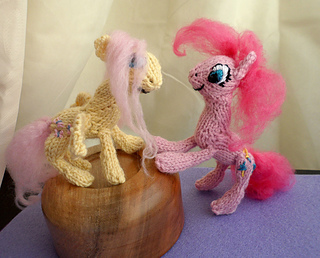 Now you can make your own little ponies, either for the little one in your life, or for yourself! 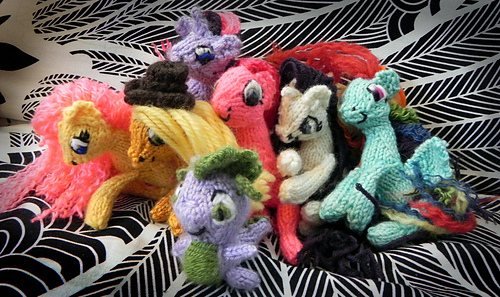 These ponies are based on the art of My Little Pony: Friendship is Magic. 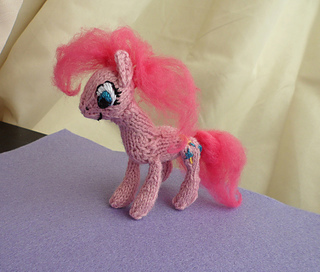 You can make any of the characters on the show, or your very own personal pony. Though you do have to attach all the pieces at the end, each piece is knit seamlessly. 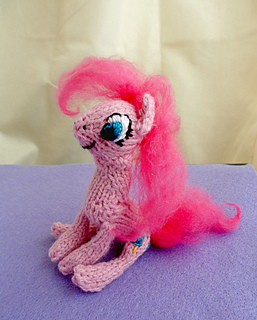 The ears and wings are flat garter stitch, the legs are based on i-cord, the head and body are in the round, and the body is shaped with short rows. Then, finish it all off with some embroidery and an innovative way of making soft fluffy hair. Ponies are rather top-heavy, but they can easily stand up on their own with the help of some light wires hidden in the legs.